We provide Bucket Elevator which is known for its effectual working among our valued clients. This Bucket Elevators help in easier functionality and provide optimum results. Our bucket elevators are available in different designs and dimensions as per the clients’ requirements. These material handling elevators are heavy duty and are capable of bearing heavy loads. We are the leading manufacturer and supplier of Bucket Elevator in Tamilnadu, Kerala, Karnataka and Andrapradesh etc. Backed by a state-of-the-art manufacturing facility, we are able to provide a wide range of Bucket Elevator Casing of fine quality. 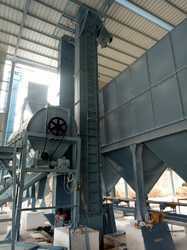 These Bucket elevators featuring a wide range of capacities for the handling of dry and free-flowing material. It consists of a cotton or rubber belt that runs on one drive pulley located at the top while the other end is the driven pulley. These are used in the rice mill, edible oil plants, sugar mill and other places.